Please note this item is currently unavailable and we do not have an expected availability date. Please fill out our form on This Page to be notified when we get some more in stock. 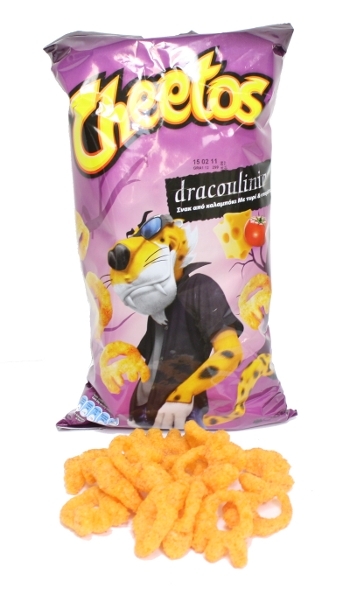 Enjoy Greek Cheetos - Dracoulinia! These tasty Cheetos have Greek spices and are absolutely irrisistible! This 60 gr (2.12 oz) bag is over 2 servings but once you open the bag serving sizes go out the window. We do not always have these in stock so hurry up and buy now before we run out! Corn Meal (55%), Corn Oil, Potato Granules, Wheat Flour, Tomato Powder (3.3%), Gammon and Onion Flavour [Rusk (From Wheat), Flavourings, Onion Powder, Lactose Powder (From Milk), Dextrose (From Wheat), Sugar, Malt Flour (From Barley), Yeast (From Barley), Celery, Flavour Enhancer (Disodium 5'-Ribonucleotide), Acidity Regulator (Sodium Acetate, Citric Acid, Malic Acid)], Cheese Powder (2.5%), Rice Flour, Milk Powder, Salt, Maltodextrin (From Wheat), Colour (Paprika Extract), Red Pepper.